"To read him is to know how the tomato plants must feel when the nitrogen hits their roots ... Legs was the idol of America." 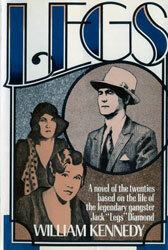 "In taking Diamond for his subject, Kennedy means to probe our peculiar American habit of reviling gangsters while pressing them for autographs ..."
Legs was an alternate selection of the Book-of-the-Month Club in September 1975. Legs was published in Denmark, France and Germany.